The Philips iU22 ultrasound machine is a perfect choice for those looking for excellent image quality, ergonomic and intuitive user interface, and solid workflow solutions. The X6-1 PureWave xMATRIX technology transducer has the ability to view high-resolution images on even the most technically challenging patients. In addition, the X Matrix technology removes the difficulty of adding 3D imaging to any exam. This ultrasound machine can easily perform both 2D and 3D volume imaging. The advantages of using one-button volume imaging are numerous, and include increased information with added tissue definition and reduced time spent per exam. 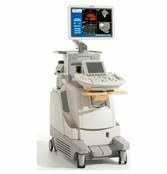 For those looking for top quality at a fair price, the Philips iU22 ultrasound machine is a perfect choice. The iScan technology allows for smart scanning; automatic one-button optimization for many parameters, including TGC, gain; and compression maps. In addition, sophisticated xPlane engineering provides the ability to view real-time imaging in two planes, without manual rotation of the image. The Phillips iU22 ultrasound machine also employs PercuNav technology similar to that used by a GPS when guiding needles for biopsy and ablation procedures. Smart Exam guided protocols allow for consistency of exams. With a wide variety of applications, the Philips iU22 is a premium choice for radiology, vascular, and OB/GYN users.